More than a profession, a lifelong passion. Pierre Frutschi graduated as an architect from the University of Geneva. An atypical creator and sailor, naval design is central to his business. The Pierre Frutschi workshop specialises in large 40’ to 100’ boats and is established in Switzerland. It has many one-off productions to its name and as many production boats. Pierre Frutschi: I am lucky to have had a career in which I have had three different jobs: architect in the building industry, designer and ocean-going sailor. However, I take inspiration and current trends from the continuing discussions I have with owners and boatyards. Closely connected with the Swift Trawler range, at Beneteau, Pierre Frutschi started to work with the boatyard in 2006 to create this long-cruising range. Pierre Frutschi: The idea of the Swift Trawler range was to revolutionise the original Trawler concept by providing good seakeeping and comfort on board that would make it a pleasurable boat full of sensations. Up until then, I had exclusively devoted myself to the development of one-off yachts and the challenge for me was to meet the requirements of a large production boat builder. Responsible for the creation of the interior design for this new exceptional range, I collaborated with the Beneteau teams and the architect Michel Joubert. Since then, we work well together and each new model has continued to enhance this offer. The latest Swift Trawler 50 is a version that takes the concept to the extreme: the lines are more slender and maximum use is made of the interior and exterior spaces. 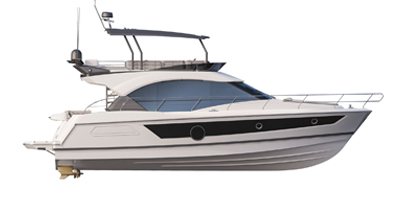 In addition, safety is given priority even in the smallest details.” By redesigning the flybridge and renewing the hull decorations, the general line of the 2016 version of this boat is even more fluid.